Consequences to parents and pupils of being absent and late. An attendance of 90 per cent means that your child is absent from lessons for the equivalent of one half day every week. Where a pupil is absent due to sickness and is genuinely unable to attend school, then the school, after being informed, may authorise a child's absence. It is important to keep the school informed if your child is going to be absent at the start of the day. Calls can be made to the school on 01457 853 611. We request that this is done by 8:45am at the latest. When your child returns to school, we ask that you provide written confirmation of their absence by filling out the pro forma found on page 19 of student planner. In law only the head teacher can authorise a pupil's absence, and may require additional evidence such as a letter from your GP. Once a child is registered in school, attendance is compulsory. It is a parent's legal responsibility to ensure that their child, when of statutory school age, accesses education appropriate to age, needs and ability. Research shows a close link between attendance at school and a child’s achievement. Being late adds up to a loss of learning. All time out of school affects learning and achievement for pupils. Please make sure your child arrives at school on time. Amendments to the registration regulations remove references to family holidays and extended leave as well as the threshold of ten school days. The amendments make it clear that head teachers may not grant any leave of absence during term time unless there are exceptional circumstances, which came into force on 1st September 2013. The head teacher may only grant leave of absence where an application had been made in advance and the head teacher considers that there are exceptional circumstances relating to the application. Granting permission in retrospect is very rare so following school procedure regarding requests for absence is very important. Should a school not agree to grant leave and parents take their child on holiday regardless, then this will be counted as unauthorised absence (truancy). 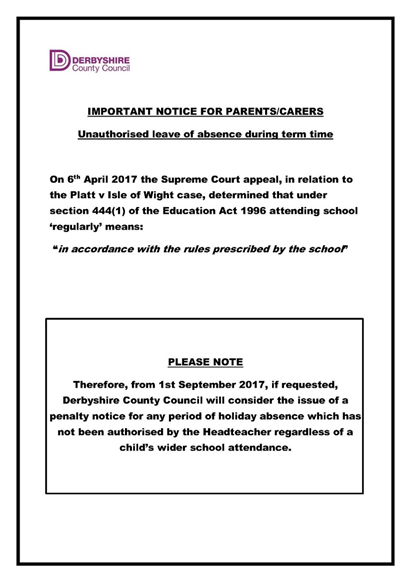 The school and the Local Authority may consider issuing a Penalty Fine or this period of unauthorised absence. The penalty is £60, rising to £120 if paid after 21 days but within 28 days. If you don’t pay the fine you may be prosecuted. The same applies to parents who take a child out without seeking permission. When can your child miss school? There is extra support available if your child cannot go to school for long periods because of a health problem. · It is up to the head teacher how many days your child can be away from school if leave is granted. · You can be fined for taking your child on holiday during term time without the school’s permission. A penalty notice is an alternative to prosecution. It requires the parent to pay a fixed amount as a fine for their child’s non-attendance and avoids court proceedings. It is intended to secure better attendance without taking legal action through the courts. The fine is currently £120 to be paid within 28 days; if the fine is paid within 21 days, payment reduces to £60. The fine applies to each parent for each child who fails to attend regularly and punctually. What are your responsibilities as a parent or carer? As a parent or carer you must make sure your child gets a full-time education that meets their needs. You can send your child to school or educate them yourself. Children must get an education between the school term after their 5th birthday and the last Friday in June in the school year they turn 16. The Government has raised the participation age (RPA) so that all young people in England are now required to remain in some form of education or training for longer. Pupils who left Year 11 in Summer 2013 had to continue in education or training for at least a further year until June 2014. Those pupils who left Year 11 in Summer 2014 are the first cohort required to continue until their 18th birthday. • an apprenticeship or traineeship. If your child is unexpectedly missing from school and the local council thinks you’re not giving them home education, you’ll be contacted by the school or the council’s educational welfare officer. They’ll contact you even if your child is only missing for a day. The Department for Education have announced that the threshold for Persistent Absence will reduce from 15% to 10% from September 2015. Previously, the persistent absence (PA) threshold, of around 15%, meant that your child had to be absent from school for around 28 days or more to have reached the threshold for persistent absence. This would have triggered intervention from the Education Welfare Service (EWS), although intervention may have started earlier for pupils who had a history of persistent absence from school. Persistent absence will reduce from 15% to 10% from September 2015. This means that from September 2015 persistent absence (PA) data will include all pupils whose attendance is 90% or less. If your child misses 19 or more days over a full academic year they will be classed as persistently absent. Taking unauthorised leave of absence early in the year could mean your child will be categorised as persistently absent well into half term five but have perfect attendance from their return date onwards. As a parent you play an essential role in supporting attendance. Persistent absence has a detrimental effect on your child’s educational progress and attainment. Over a five year period a child whose attendance is at 90%, will miss a half of a school year; that’s a lot of lost education! You can be given one or more of these orders but the council does not have to do this before prosecuting you. This means you have to go to parenting classes. You’ll also have to do what the court says to improve your child’s school attendance. If the council thinks you need support getting your child to go to school but you’re not co-operating, they can apply to a court for an Education Supervision Order. A supervisor will be appointed to help you get your child into education. The local council can do this instead of prosecuting you, or as well. You’ll get a School Attendance Order if the local council thinks your child isn’t getting an education. You have 15 days to provide evidence that you’ve registered your child with a school or that you are giving them home education. The order will require you to send your child to a specific school. If you don’t, you may be prosecuted. Instead of being prosecuted, you can be given a penalty notice. The penalty is £60, rising to £120 if paid after 21 days but within 28 days. If you don’t pay the fine you may be prosecuted. You could get a fine of up to £2,500, a community order or a jail sentence up to 3 months. The court also gives you a Parenting Order.